Research In Motion is not exactly the hottest commodity on the planet at the moment, and the BlackBerry manufacturer is struggling in more ways than one. Not only that, their foray into the tablet market has not exactly been the most encouraging event in the company’s history to date, but thankfully the PlayBook has not been scrapped – yet, going the way of the HP TouchPad. Having said that, RIM has introduced an accessory that I believe will have an equally hard time to sell in the open market – the BlackBerry Mini Keyboard. After all, how many people do you know actually own a BlackBerry PlayBook tablet, let alone use it proudly whenever they are commuting? Just a handful, right? 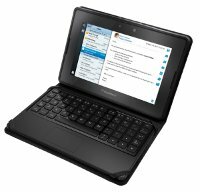 I suppose for this niche market group, you might use your tablet more for work than gaming purposes, hence a fair bit of typing needs to be accomplished, which is where the BlackBerry Mini Keyboard comes in handy. It will hook up to your BlackBerry PlayBook via Bluetooth, and when connected, the virtual keyboard on the PlayBook will remain well hidden throughout the duration so that your eyes will be able to take advantage of the maximum screen size. Apart from the full QWERTY keyboard, it also comes with an integrated touchpad that enables you to navigate and control the BlackBerry PlayBook as though you were using the touch screen on the tablet itself. It can also fold up to function as a tablet stand whenever you want to watch a movie or be passively entertained. Back to the touchpad on the BlackBerry Mini Keyboard – it is capable of supporting BlackBerry PlayBook gestures, in addition to gestures that are all too familiar with those who use standard mouse and touchpad controls on a laptop, including a single tap that functions as a mouse click, while a two finger tap will right-click, and a two-finger up or down swipe will scroll the display vertically. Measuring no more than 6mm in thickness, all data sent to the BlackBerry PlayBook is done over 128-bit encryption for added security. The BlackBerry Mini Keyboard can be yours for a rather hefty $119.99.